When you stay at The Palms by Suite at the Beach in Myrtle Beach, you'll be near the beach, within a 5-minute drive of SkyWheel Myrtle Beach and Ripley's Aquarium. This 4-star condo is 2 mi (3.2 km) from Broadway at the Beach and 2.4 mi (3.8 km) from Family Kingdom Amusement Park. Make yourself at home in one of the 19 individually decorated guestrooms, featuring kitchens with full-sized refrigerators/freezers and microwaves. Rooms have private balconies or patios. Flat-screen televisions with cable programming provide entertainment, while complimentary wireless Internet access keeps you connected. Conveniences include coffee/tea makers and irons/ironing boards, and you can also request rollaway/extra beds (surcharge). Dip into one of the 3 spa tubs or enjoy other recreational amenities, which include a fitness center. Additional amenities at this condo include complimentary wireless Internet access and a picnic area. 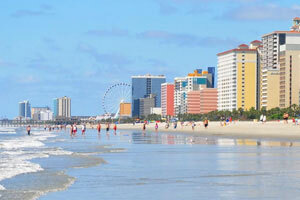 The preferred airport for The Palms by Suite at the Beach is Myrtle Beach, SC (MYR).